One of the things I love about Portland are the small businesses that make it a great place to live and eat. When we have family visit, I always want to point out how few large chains we have and how businesses thrive on being different. A fabulous example of this is a business called Local Plate. I was recently approached by one of the creators to try out their service. Local Plate offers meals made up of all locally sourced (and in many cases, organic) ingredients. I did have some reservations about Local Plate before ordering. I worried, first, that pick up was going to be mandatory and somewhere much further than I was wanting to go on a normal basis for grocery pickup. This, however, turned out to be a misconception. Once you order through the site, the meals can be picked up or delivered to your door (free of charge!). I decided to pick my order up because the pickup spot I selected was in 10 minutes of my house at Know Thy Food in SE Portland. This pretty REFRIGERATED bag from Local Plate is included in the order (via The Spicy Bee Instagram). Another reservation I had was price–Just like many others I’ve spoken to about grocery costs, $8-$12 per plate for a meal in seemed a bit steep (I’ve divided ours out based on a grocery budget of around $150 per week and we spend about $4 per person per meal)–however, when we eat out we average about $30 (not including tip)–so for our budget, Local Plate falls within that sweet spot between “we wouldn’t do this every night” and “I want fantastic food but don’t want to go out.” Although I try to get locally sourced ingredients for our meals, if the week is hectic (which the last few have been) I rely on Trader Joe’s and New Seasons to fill my cart. Their produce isn’t usually locally sourced and New Season’s meats are, at best, 50/50 for being local. The void of being able to source all the ingredients with little effort myself is where Local Plate fills a real void in my life. After skimming through Local Plate’s website and reading different recipes, I decided on their Flat Iron Steak Salad with Herbed Rice. 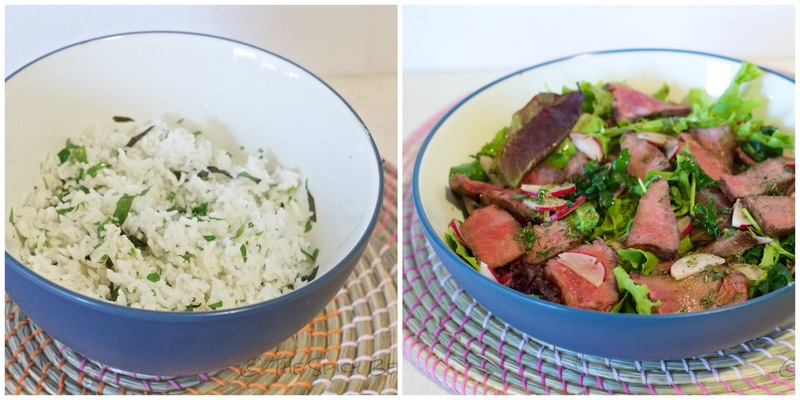 The recipe for the Flat Iron Steak Salad seemed extremely attractive, especially after I learned the source of the steak! The quality of the ingredients sourced for Local Plate are unparalleled to what I’ve found in one spot in Portland, and what I like is how you can see all the food sources before you even put your order through. what if you don’t cook? Imagine you want to do something nice for someone, but you have no experience cooking? Does that mean Local Plate is out of your realm? Perhaps you enjoy great quality food, or the person you’re cooking for does–would you be able to pull off this meal without much stress? I ask because that’s sort of the point of Local Plate, isn’t it? 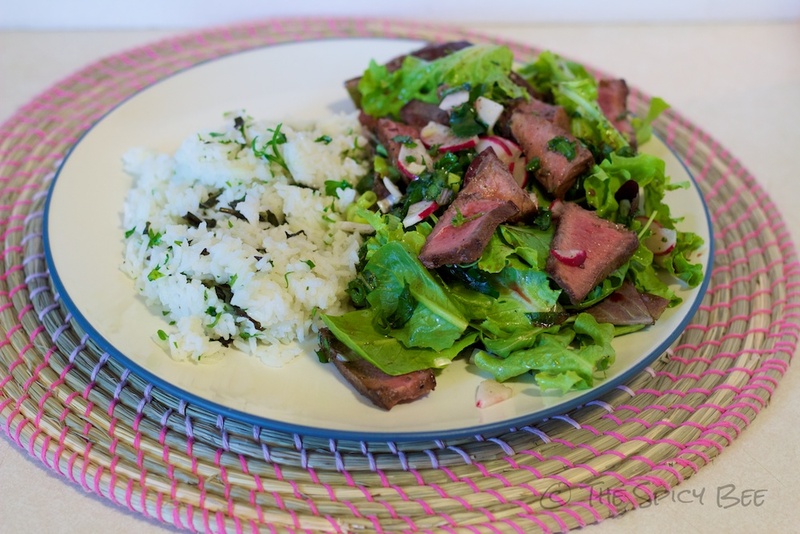 to have one stop shopping to great ingredients that product knockout meals like Flank Steak Salad with Herbed Rice? Does this mean that the average Joe is out of luck? I would say they may well be–depending on the meal. In order to “get your money’s worth” I would highly suggest at least a basic knowledge of cooking meats (including fish), cutting vegetables, and (in this recipe’s case) massaging kale. I want to share more than just information about Local Plate with you. I want to share the recipe that led to a very happy, healthy meal for my household. 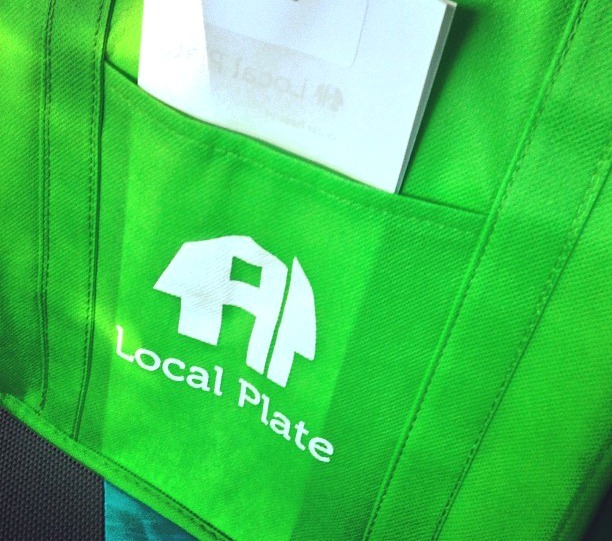 When well-executed, the quality of ingredients and recipe provided in this neon green Local Plate bag yield a delicious meal worthy of being served in a high end Portland restaurant. Put the greens, radishes, herbs and scallions in a large salad bowl or platter. Stir the dressing ingredients together in a bowl. Pat the beef dry with paper towels and sprinkle generously with sea salt. Heat a heavy-bottomed skillet or cast iron pan over medium-high heat. When the pan is hot add the meat and cook, undisturbed for about 3 1/2 minutes. Flip the meat with tongs and cook for 3 1/2 to 4 more minutes. This should give you a medium rare steak if the steak is about 1 1/2 inches thick. Remove the steak from the pan and let rest on a cutting board for at least 5 minutes. Slice the steak thinly across the grain. You can either leave it in long strips or cut it into smaller pieces and then toss with the greens and the dressing. You can also just dress the greens and serve the sliced steak on the side or on top of the salad. Taste and adjust seasoning with salt and/or pepper. This is a fragrant twist on plain white rice. If you have a rice cooker, put the rice, salt and water in it and start the cooker. If you’re cooking it on the stovetop add the rice, salt and water to a medium saucepan, cover and bring to a boil. Turn down to a simmer and cook, undisturbed for about 15 minutes until all the water is absorbed and the rice is tender. When the rice is done add the butter and herbs and gently incorporate. Taste for salt and adjust to your liking. This recipe is from Local Plate. It makes (2-3 servings–closer to 3 in my opinion). **Added note: if you have kale, be sure to remove the stems and tear it into small pieces. Then add some olive oil into a bowl and massage the kale in it for a few minutes. This will bring out a rich color and will tenderize the kale making it a pleasure to eat! Questions or experiences with Local Plate? Feel free to share below or contact me.